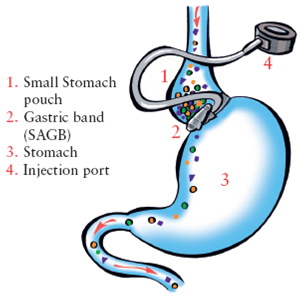 Laparoscopic Adjustable Gastric Banding involves inserting a specially made band around the top of the stomach. This is done with a keyhole technique so recovery is quick. During the course of the surgery, no organs are cut, removed or rearranged, hence the procedure is completely reversible. The section of stomach sitting above the band (pouch) can only hold a small amount of food. It is also this part of the stomach that generates the sensation of feeling full (satiety). As a small amount of food is eaten, it fills the pouch and a sensation of fullness is felt and hunger is reduced. The food then slowly passes through the band into the rest of the stomach and is digested in the normal way. The key to success with Laparoscopic Adjustable Gastric Banding is to be consistent in eating good, healthy nutritious solid food. You have to learn to eat slowly and chew very well. It is important to avoid the temptation to eat soft or liquid type foods. These pass through the Laparoscopic Adjustable Gastric Banding rapidly, do not create a sense of fullness, so food consumption remains high and weight is not lost effectively. It is important to understand that liquids are not restricted by the band so only low calorie drinks should be consumed. Beware that foods such as chocolate and ice cream are effectively high calorie liquids which the band simply will not stop. The band has an inflatable balloon along its inner border. This can be expanded with saline injected though an access port sitting beneath the skin. As the band is inflated, it gets tighter, giving greater restriction to food passage and increased satiety. Clearly if the band is too tight, food may not pass and regurgitation results. If the band is too loose, no restriction is experienced and so no reduction in eating occurs. The aim of band adjustment is to have the band at the right level of tightness so that regurgitation is minimised but portion control is achieved. 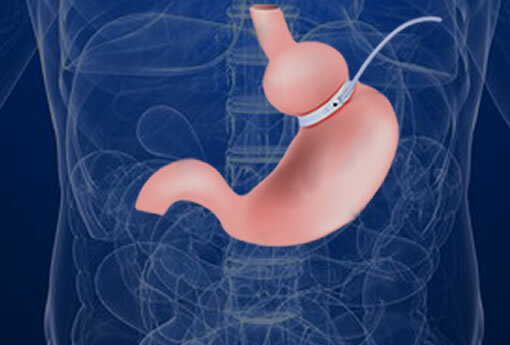 Laparoscopic gastric banding is the safest and simplest bariatric procedure available. Most patients are in hospital overnight only and are well recovered by one week. There are some specific complications peculiar to the band – erosion, slippage, port infection and device failure such as tubing fracture. These are uncommon but may require repeat surgery. Risks will be discussed in more detail with your surgeon.